Butter Chicken is a favorite in our house. This is one of our go to options for company and even though most haven’t had it before, this dish is loved by everyone. Serve with naan for an extra tasty meal or simply have a salad to round out the meal. Don’t let the list of ingredients scare you. This recipe is actually easy and comes together quickly. All of the ingredients except garam masala are ones you already have and trust me, garam masala is worth purchasing. You’ll want to make this many times and this Indian Layer Dip also uses it. The leftovers taste just as good so this is a meal you could prepare the night before and pull out and gently reheat on the stove while the rice is cooking on a Sunday after church. If you enjoy Indian food, you’ll want to see next Friday’s recipe – one of my favorite breads ever (and a great option to serve along side this dish)! In a large pan saute onions until tender. Add in ginger, garlic, butter, lemon juice, garam masala, cayenne, cumin, chili powder, and bay leaf. Cook until ginger and garlic are done. Add tomato puree and stir and heat through. Add in half and half and yogurt. Let simmer for 10 minutes, stirring occasionally. Add salt and pepper to taste. Adjust other seasonings if needed. In a skillet heat a small amount of oil and brown chicken. Add a few spoonfuls of cooked sauce and let the chicken finish cooking. Add cooked chicken to the sauce mixture. Combine and arrowroot powder and water and add to the butter chicken. Cook until the mixture thickens and is heated through. Serve over hot cooked rice. This entry was posted in Main Dish on March 7, 2014 by Deanna Michaels. This looks delicious. 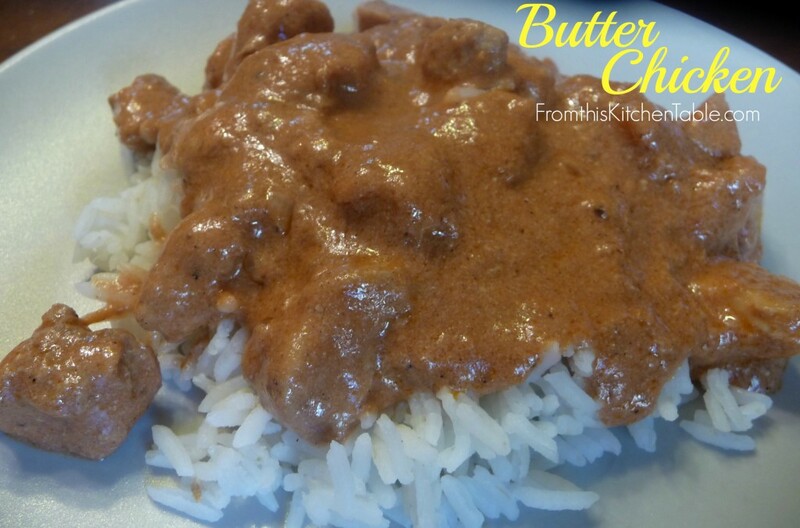 I tried butter chicken once a couple of years ago but it didn’t turn out as well as I’d hoped. I think I’ll try it again with this recipe. I hope you like this recipe! It’s one of our favorites. We’ve made it for company many times and it’s well liked. Yay for another butter chicken lover! It’s sooo good. One of our favorites to make. Thanks for commenting! It is sooo good! One of my favorite Indian dishes to eat and make. Some are so time consuming, but this one is pretty easy. The flavors are also pretty mild so it’s great for serving to company. I hope you enjoy it! Thanks for hosting and for pinning! Looks just plain yummy!! Can’t wait to try it – I think the hubby will really like it!! It is sooo good! I hope that you guys enjoy it as much as we do! Thanks, this looks so good! We love this dish. I hope if you make it, you enjoy it as much as we do. Thanks for stopping by. It is so good! One of my favorites. Thanks for stopping by and commenting! Anything with butter in the name is a winner in my book! This looks so delicious! Well, we don’t eat dairy, but I’m guessing I could sub almond milk for the half n half and just leave out the yogurt. It won’t be as thick, but it looks so good, I want to try it out anyway! I’m sure it would work. You could also add a little more arrowroot powder. You’ll have to let me know of it turns out if you try it! Woot!SO glad it worked out. The paste was a great idea, I’m going to remember that if I ever need to make it dairy free. It is one of our favorite recipes. Love quinoa! I use it for lunches for myself a lot and occasionally for supper but not super often because my husband isn’t the biggest fan. Thank you so much for letting me know how it turned out! I’ve never heard of butter chicken, but this looks delicious! Thanks for sharing at Fridays Unfolded! Butter Chicken is amazing if you like Indian food. Highly recommend you try it if you ever are near a restaurant. Thanks for hosting. G’day LOVE Butter Chicken Deanna! YUM! Thanks for sharing at the Foodie Friends Friday No Rules Party! Hooray for another Butter Chicken lover! Isn’t the stuff amazing. Thanks for stopping by and for hosting! This looks delicious! Thanks so much for linking up with Let’s Get Real this week. It is fabulous! Thanks for hosting. This looks like a wonderful recipe and is great especially when wanting to change up the normal chicken dishes. Thanks for linking up again this week with us at the #WWDParty! IT is fabulous. You are right, it’s a nice change of flavors. And you never have to worry when serving to company about them having had it the night before. Lol! How funny. We love Indian food in our house. 🙂 Mmmmm, good stuff. Thanks for your sweet comment, Carrie! I love Indian food…I don’t think I’ve ever had an Indian meal I didn’t enjoy. I definitely want to try this! Pinning it right now! As do I! Indian is incredible and this is a favorite! Thanks for commenting and for pinning! This sounds amazing, I need to make this soon! Thanks for sharing at The Happiness is Homemade Link Party, you are being featured so make sure you to come back on Sunday and grab our button! It is soooo good! I hope you enjoy it if you make it. Thanks so much for hosting and for featuring the recipe! I love Indian food but I haven’t gotten around to trying butter chicken. What better way to try it than making it myself? Thanks for sharing. Love hearing of other Indian food lovers! Hope you enjoy this recipe as much as we do. We LOVE this recipe. Hope that you guys too. Yeah, you can use the preminced/pureed garlic and ginger. I think tomato sauce would work too – it just has some salt and seasonings already added in so you might want to not add quite as much salt. Let me know what you think!